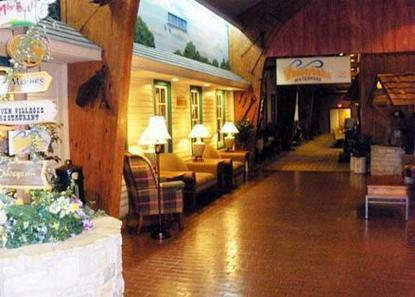 Welcome to the Little Amana Holiday Inn Hotel & Wasserbahn&reg Waterpark near Iowa&regs historic Amana Colonies. Little Amana Complex can accommodate all your needs from shopping & dinning to meetings & leisure. Amana Holiday Inn is great for family reunions or to celebrate your wedding rehearsal, reception, or anniversary. Conveniently located at Exit 225 on Interstate 80. On site are Amana Woolen & General Stores, Winery, Antique Shop, & Little Amana Maid-Rite diner. With seating for 15 to 350 people, we accommodate all groups. Close to the University of Iowa health care facilities. Close to the Coral Ridge Mall & the Tanger Outlet Mall at Exit 220, Williamsburg. Herbert Hoover Presidential Library in West Branch, the Kalona Amish settlement, also Kinnick Stadium or Carver Arena, & Hancher Auditorium at the University of Iowa, Old Creamery Theatre, Bike & Nature Trails, & Pella&regs Dutch community. The Seven Villages Restaurant located in the hotel features Amana style German favorites as well as a wide selection of American family favorites & plate lunches. Visit Wasserbahn&reg waterpark with over 11,000sqft. of slides, pools, spray hoops, geysers, as well as a hot tub and sauna. Our Wooden Nickel game arcade is the place to go Try out the 18hole Mini Golf course, or outdoor playground.The Amana Colonies Holiday Inn is, Comfortable, Convenient. Come stay with us This hotel is committed to providing accessible facilities under the American Disabilities Act. If your accessibility needs are not met, please contact the Hotel Manager on Duty. Should you require additional information regarding accessible facilities for guests with disabilities, please call 1-800-Holiday (U.S. and Canada) or contact the hotel directly. For the hearing impaired, TDD service is available at 1-800-238-5544 within the U.S. and Canada.